Johnny’s Auto Trim and Rod Shop is an underdog story. In the late 80′s, Johnny laid brick for a living and soon decided working in the cold Colorado winters was not something he wanted to do all his life. He decided to sit down and make a list of things he was passionate about and things that were lacking in his hometown of Alamosa Colorado. After narrowing the list down, he decided he would try his hand at upholstery in street rods. Johnny then went to the library and checked out books to start learning the craft. That winter his wife bought him a sewing machine and Johnny begin covering and “uncovering” truck and tractor seats in his living room. After many years of hard work and determination Johnny was nationally recognized for his sleek and classy upholstery jobs. Soon Johnny started complete custom hot rod builds In 2011 Johnny and his team as recognized with a Detroit Great 8 Pirelli award at the Detroit Autorama for the 1962 Corvette convertible, named “Elegance,” Johnny did this with his small team comprised of his son, daughter and nephew. Many friends and family were there to support and to help whenever needed. 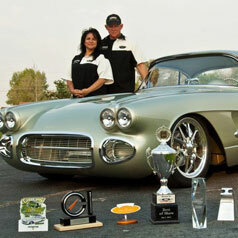 Most recently Johnny and his team comprised of his son and manager Ryan Martin and Craig Rogers Body Tech were recognized with the prestigious Detroit Autorama Don Ridler Award with a 1957 Chevy named “Imagine”. Imagine would have not been possible without the support of friends and family.